I am busy inking in the gaps… in the meantime, look at some of the pics on the earlier blog! Sean had arranged to get a lift to Cape Town on Wednesday morning with friends of his. He was off to see the Coldplay concert at the new Cape Town Stadium (built for last years FIFA World Cup) and was scheduled to meet up with us again on Thursday morning. We were off to the Waterkloof Wine Farm – just behind Somerset West on the slopes of the Hottentots-Holland Mountains, and we had to be there before 10h30 in order for me to do my AlgoaFM chat show via telephone to host Lance du Plessis. Waterkloof is a modern newly-built wine farm, and they say “every picture tells a story” and “a picture is worth a thousand words”! So please look at the photos accompanying this blog and at the previous photo blog and admire the beauty of the Hottentots Holland basin, the HH mountains, Sir Lowry’s Pass, Gordons Bay, Strand, Somerset West, False Bay and the Cape Peninsula in the distance. My words can certainly do no justice to such magnificence! After my interview (which was minimal as a result of a discussion about the dangers of fracking – listen to the podcast), we did our first wine tasting of the week: the Waterkloof wines. Then we headed off for lunch on the other side of Somerset West, behind the Helderberg, on the way to Stellenbosch. This time we were visiting the farm Avontuur, the owner of which is now married to Jake White, the ex Springbok rugby coach. A splendid meal was had on the terrace, with a view of Table Mountain and Devil’s Peak in the southern distance and the Helderberg as the northern vista. We got home late afternoon, and barely had time for a short snooze, before we were picked up by Sebastian and his father and friend Kallie van Heerden. 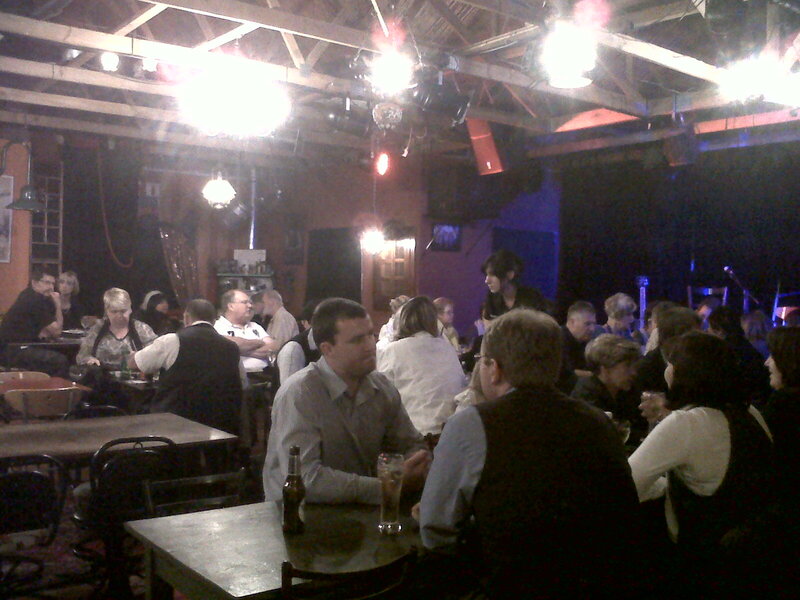 This time we were heading off to Durbanville and to the Die Boer Theatre – sort of restaurant come theatre come pub all rolled into one. It’s owned by Jurgen Human, who studied electrical engineering with me at Stellenbosch and once courted my sister. He went on to work at the SABC, married Afrikaans theatre doyen Dowwe Dolle and is now involved in this theatre venture. It’s quaint, it’s fun, it’s enjoyable. You eat and you drink and you listen to the music. And tonight it’s Country and Western! The band playing is Rocking Horse, and two of the members of the band of three are Ridgways, cousins of Sebastian and sons of Sebastian’s father’s late brother. So it’s all in the family tonight, except for Sean, who by now was rocking away at the Coldplay concert in Green Point. So, today had been one of wine, food and song. Another great day which was serving as the prelude for our much-anticipated trip to Robben Island on Thursday. And the weather was forecast to be an even better day – warm and windless.